When it comes to US poker sites, prepaid cards are one of the most secure and efficient ways to manage your account online. If you’ve never anted up online using this friendly banking method, it’s relatively easy and incredibly secure. But there are a few things to keep in mind before you make a US poker room prepaid card deposit. Read on for all the info. What are Prepaid Card Poker Sites? Prepaid cards poker sites, as the name would suggest, are online poker rooms that accept deposits using a card that has been pre-loaded with cash. Available in a variety of forms and great for online poker, US prepaid cards essentially offer a safe and secure way to fund your account. Moreover, because prepaid cards aren’t connected to your bank, they provide a much cleaner way of managing your bankroll. Regardless of how often you play poker online, prepaid cards offer a convenient way to fund your account. In fact, even if you don’t use prepaid cards as your main deposit method, they are a handy option to utilize if you’re travelling around Europe or the USA. For example, if you’re not comfortable with taking your credit/ debit card on a short trip, but still wanted to play online poker, prepaid cards offer a way for you to fund your account on the move. Available from a number of outlets across the USA and the rest of the world, this payment option is basically a one-stop, one-off payment solution for poker players. Although the landscape is somewhat unclear, US poker sites, prepaid cards and players can all co-exist in harmony. – Available for deposit – Yes for both European and American poker players. – Available for withdrawal – No. When it comes to online poker sites, prepaid cards are only used for deposits. – Money available instantly – With regards to prepaid cards, poker sites will process deposits instantly and that cash will be waiting for you in seconds. – Success rates – The deposit success rate for online poker prepaid cards is 100%. 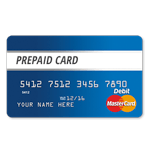 – Fees associated – There are no fees associated when using prepaid cards. In situations when currency conversions are necessary, prepaid card companies will usually charge a fee of around 2% on top of the transaction. Firstly, you need to select one of the many prepaid cards on the market and purchase one that corresponds to the amount you wish to deposit. Secondly, you need to navigate to your chosen prepaid cards poker site and find the cashier page. At this point you need to select one of the prepaid card options and enter the amount you want to deposit as well as a special PIN number. Finally, click “deposit” and the transaction will be processed instantly. When it comes to online poker sites, prepaid cards can only be used as a deposit option. 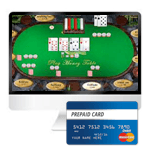 Online American poker players may enjoy the convenience of using prepaid cards at many US poker sites. 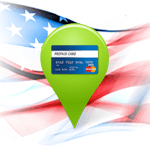 USA Poker Rooms That Accept Prepaid Card Deposits: Are They Safe? In short, prepaid cards poker sites are extremely safe. Because there is no connection between your bank and the prepaid card, there is very little chance a cybercriminal could hack into your account. All prepaid cards can be purchased with cash which is then converted into “virtual money”. This is the only relationship the card has with your wallet and the reason why, when it comes to poker online, prepaid cards are a preferred deposit method for serious grinders across Europe and the US. In one form or another, this deposit method is available to grinders in the USA. In terms of United States poker sites, prepaid cards offer players one of the most reliable ways to fund their accounts. Because there is no connection between your bank and the prepaid card, it means there is very little chance of your transaction being denied. Moreover, in the ever-changing legal landscape across America and online poker, prepaid cards are being utilized by operators themselves. Aside from market leaders in the prepaid market, poker rooms are creating their own prepaid cards that allow players to fund them with cash and processes payments specific to that site.